Don't be afraid of the "Tart" label on Bridgeport's latest "Big Brew", this year's Stumptown Tart. A wheat beer flavored with fresh cherries, it certainly has a little citric tang that lingers briefly on the tongue, but it is not oppressively sour. The 2008 marionberry incarnation of Stumptown Tart -- itself on the tame end of the tart-beer spectrum -- was far more sour. 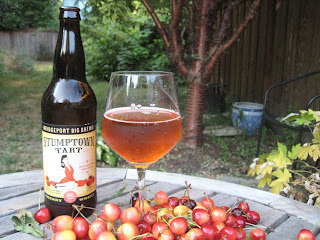 In fact, I didn't much care for last year's Tart, but the 2009 cherry Tart is a lovely, refreshing beer. Its earthy cherry-pie flavor blends perfectly with a base that is quite dry but not at all astringent. Even though the flavor really will remind you of cherry pie, it's not cloying -- really it's not noticeably sweet at all. Another nearly undetectable ingredient is the alcohol. This is a big beer -- 8.3% ABV -- but there's no boozy flavor at all. The 2009 Stumptown Tart is a real gem. In the past, I've gone off on the sour beer craze. I'm not totally opposed to tart or funky flavors in beer, but when there's no other notable flavor, or when the sourness steals the attention from everything else in the beer, count me out. Hence, I'm unable to enjoy beer-snob darlings such as Russian River Supplication or the Duchesse de Bourgogne. A little farmhouse funkiness is OK with me, and I even found some love in my heart for Dogfish Head's very tart Festina Peche. But the "tart" in this year's Stumptown Tart is a red herring. It's definitely worth a try even if you shy away from sour beers or fruit beers. Bridgeport's brewmaster, Karl Ockert, thinks it will age well for a year or two. Since I like the fresh article so well, it's not obvious to me how aging would improve it, but I did hide one bottle in my basement out of curiosity. The 22 oz. bombers have been selling for around $5, a pretty good deal ($16.36 SPE) for a beer this big. Get it while it lasts.